The solar panels stood tall against the icy expanse as the four-person team approached on snowmobile. GZ20 hadn’t seen visitors in a year, having endured yet another brutal Antarctic winter since the last time its human caretakers checked in. But the fact that its power source could be seen from over three kilometres out—a speck of black in a world of white and blue—told Colorado School of Mines glaciologist Matt Siegfried the lonely GPS station was in good shape. That intuition turned out to be right. Servicing the GPS station—one of eight similar ice-monitoring rigs scattered across West Antarctica’s Mercer and Whillans ice streams—was “a dream”, he wrote us via satellite internet. In short order, the team had unjammed its ice-crusted wind turbine, raised its antenna, and re-configured its modem, setting it up for another year of near-continuous data collection. With blue skies overhead and the Transantarctic mountains smeared along the horizon like a real-life version of the Ice Wall from Game of Thrones, it was as picturesque a day as one can hope for doing tech repair work at the bottom of the world. Researchers are left to their own devices for weeks to months on end, sleeping in unheated tents and surviving off a stash of snow-preserved food while racing to collect as much data as physically possible in the time allotted. Siegfried and his team members—three scientists and one mountaineer—are in the midst of a six-week sojourn on West Antarctica’s Siple Coast, living out of an unsupported field camp 375 miles from the South Pole. The group is there to study subglacial lakes, mysterious basins thousands of feet underground that are scattered across Antarctica. The highlight comes in a few weeks, when they meet up with a crew of about 50 others and attempt to melt a hole through 4,000 feet of ice to tap into subglacial Lake Mercer. But tending to the region’s long-term GPS array is also critical. First installed in 2007, the array has been faithfully tracking the region’s lakes by collecting data on the motion of the overlying ice for more than a decade. Likely the longest-running GPS experiment on an Antarctic ice stream, the stations have helped reveal how quickly these lakes can fill and drain and what that means for the ebb and flow of the frozen rivers riding atop them. As the climate warms and Antarctic ice losses accelerate, such information could help forecast the future of Earth’s coastlines. The GPS array is slated for decommissioning in 2019, meaning if no additional funding is secured, the next time scientists come out here, it’ll be to dig the stations out of the snow and lug them away. The experiment’s loss would not only spell the end of a unique dataset on the world’s most isolated lakes. With NASA’s recently-launched ICESat-2 mission now streaming data back to Earth, a key tool for double checking the ice-monitoring satellite’s measurements would vanish, too. Even so, the experiment will have had an impressive run. “If we end up removing them next year, we’ll need to pour one out so to speak,” Siegfried said. The fact that this experiment ever came to be was “pretty serendipitous,” according to Scripps Institution of Oceanography professor of glaciology Helen Amanda Fricker. In late May 2006, Fricker spotted a weird signal in some data from NASA’s ICESat mission, a satellite that bounced infrared light off Earth’s poles to measure changes in the height of the ice from space. After consulting colleagues, plotting the numbers and examining more ICESat tracks, Fricker realised the anomalous signal was the result of something truly wild: a network of lakes buried far below the Whillans and Mercer ice streams that were moving huge amounts of water, causing the ground above to rise and fall like bread dough as they filled and drained. Scientists had been documenting so-called subglacial lakes—formed at the bottom of glaciers by the pressure of the ice above, heat from the Earth’s mantle, or both—since the 1970s using radar. But until the early 2000s, most of the lakes we’d discovered were deep, closed basins that moved water at, well, a glacial pace. East Antarctica’s Lake Vostok, a 4,000 square mile behemoth buried beneath 13,000 feet of ice, is thought to refresh its water about every 10,000 years. Subglacial lakes Mercer and Whillans—tots by comparison, spanning just 19 and 54 square miles respectively—seem to be filling and draining on timescales of months to decades. Fricker realised the anomalous signal was the result of something truly wild: a network of lakes buried far below the Whillans and Mercer ice streams that were moving huge amounts of water, causing the ground above to rise and fall like bread dough as they filled and drained. “These lakes are super dramatic,” Siegfried said. The discovery of such dynamic buried lakes—and the realisation that ICESat could be used to hunt for more of them—landed Fricker’s weird signal in a paper in Science the following year. Around the same time, Slawek Tulaczyk, a glaciologist at UC Santa Cruz, was preparing to deploy a series of GPS stations onto the Kamb Ice Stream, another West Antarctic river where radar data hinted at water passing through a buried lake system. Tulaczyk and his colleagues published a paper on that data in 2005, and their US National Science Foundation (NSF)-funded GPS array was an opportunity to get fresh observations. But after reading about Fricker’s lakes—which, per Tulaczyk, were “more variable, bigger, and looked more interesting”—he knew he had to retool his project. “So I turned around to NSF and said, these lakes are way cooler, how about we take the same approach and same idea and move [over there]?” Tulaczyk said. The funding agency and Fricker both agreed, and by the end of 2007, the researchers had teamed up to install 10 UNAVCO GPS stations—rigs equipped with up to ten car batteries each, solar panels, and portable wind turbines—across the Whillans and Mercer ice streams. The GPS array has been up and running in some form ever since. In 2009, as Fricker and Tulaczyk’s initial project was winding down, it was inherited into the Whillans Ice Stream Subglacial Access Research Drilling (WISSARD) project, and expanded to 23 stations. 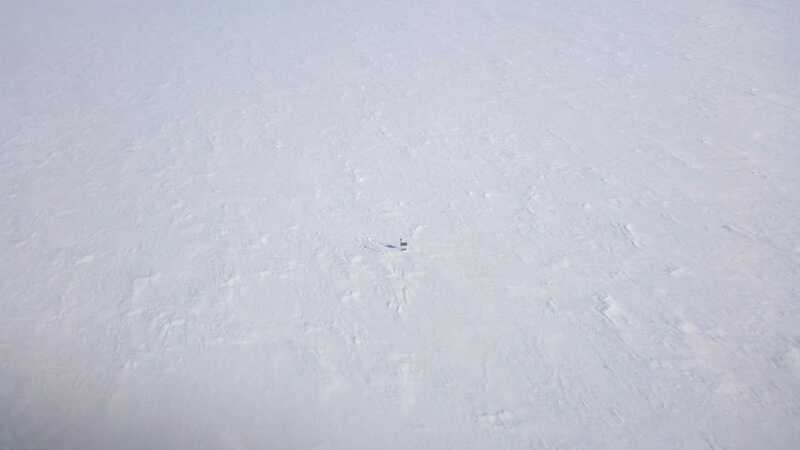 The highlight of the WISSARD program came in 2013, when scientists used a hot-water drill to melt through half a mile of ice and collect samples from Lake Whillans. The first subglacial Antarctic lake ever directly accessed by humans, Whillans’ waters revealed Antarctica’s dark underbelly is teeming with microbial life. After the WISSARD project ended in 2015, eight of the stations were funnelled into the Subglacial Antarctic Lakes Scientific Access (SALSA) project, which will attempt to sample a subglacial lake—Mercer—for just the second time in human history in the coming weeks. All the while, the GPS stations situated thousands of feet above have been gathering intel. Their high-resolution data on surface elevation has helped ground truth measurements from NASA’s ICESat mission, which ended in 2009, and the European Space Agency’s Cryosat-2, a satellite radar altimeter that began acquiring data in July 2010. Stitching together data from all three sources, Siegfried and his colleagues have reconstructed a more than 10-year long history of the lakes that shows them draining and filling repeatedly. Because the GPS stations also measure horizontal motion of the ice, the researchers have started to connect these fill-drain events to significant changes in the movement of ice streams. With about 400 subglacial lakes now documented across Antarctica—and the expectation that more will be found with ICESat-2—such information is key for understanding how quickly the frozen continent is dumping ice into the sea, where it can contribute to rising sea levels. “To have this long time series is really powerful in terms of understanding the ice dynamics,” Fricker said. Maintaining the GPS array has been no small task. The stations along with their power supplies can weigh anywhere from 500 to 1,000 pounds, and each had to lugged approximately 500 miles from McMurdo station via aircraft or heavy vehicle traverse (basically, a giant ice tractor). 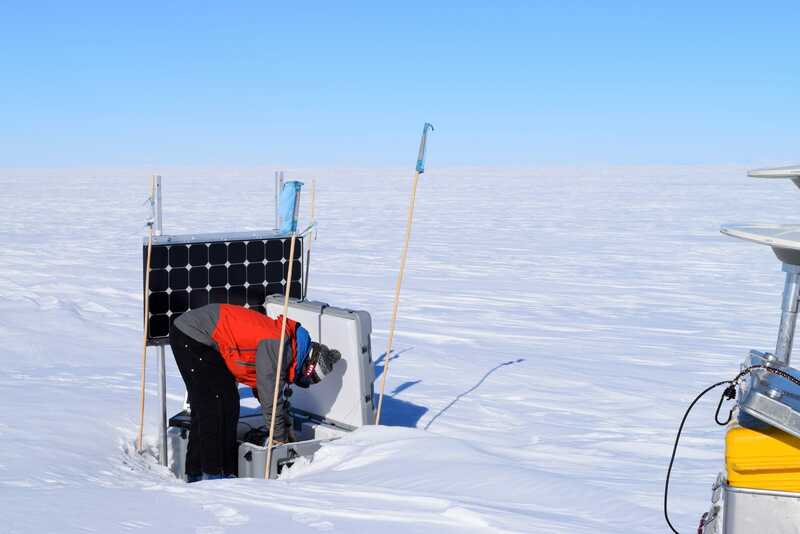 Every summer, scientists like Siegfried have trekked out to the stations to do a slew of maintenance tasks, from digging 75 pound batteries out of the snow and resetting them on the surface, to swapping out broken parts to downloading the most recent data. “I’m a glorified manual labourer when I’m down there,” Siegfried said. While they’re currently working under the assumption that the array will be finished next year, Siegfried and Fricker are both thinking of ways to extend the project’s life, given how unique this kind of long-term data set is. The recent launch of ICESat-2 offers one possible avenue. As NASA scientists revealed at the annual American Geophysical Union conference last week, the satellite is already sending back data that will be used to make gloriously detailed maps of Antarctica’s rugged terrain. Siegfried said he’s sharing the GPS array’s data with NASA to spot-check what the satellite is seeing. If the science itself is remarkable, so are the skills needed to live out on the ice and keep it going. This summer marks Siegfried’s sixth in an unsupported field camp, where researchers are left to their own devices for weeks to months on end, sleeping in unheated tents and surviving off a stash of snow-preserved food while racing to collect as much data as physically possible in the time allotted. The team was set down at their campsite on 19 November—a “beautiful, near-windless” day per Siegfried—by a National Guard LC-130 plane. Within a few days, a springtime weather system had arrived and 40 knot winds were blowing snow everywhere. 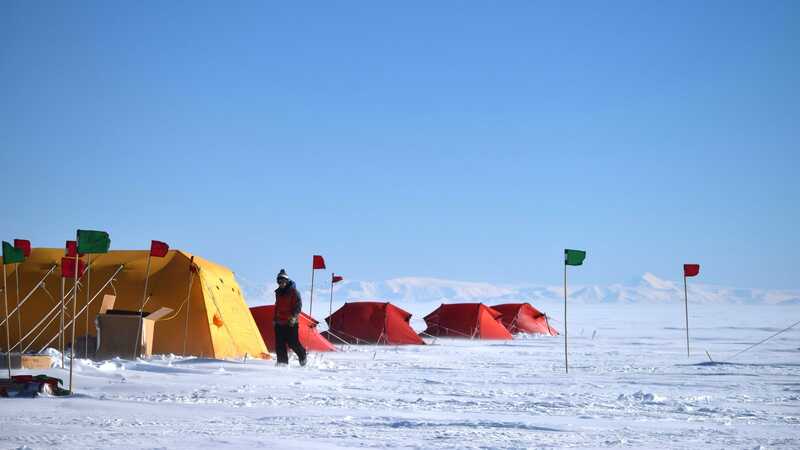 In between repeatedly digging their tents and gear out of the powder, the team has already managed to do a considerable amount of science, including installing new “magnetotelluric” stations which measure the electrical and magnetic properties of the ice streams to map subglacial water. Like maintaining the GPS array, installing these stations basically involves a lot of backbreaking digging. “While talking about field work in Antarctica back in the States frequently elicits some sort of awestruck response, in reality we spend most of our time unstrapping and re-strapping cargo, neatly bundling cargo straps, digging, and waking up sore the next day,” Siegfried wrote in an email.